Bret Baier, host of Special Report with Bret Baier on the Fox News Channel, will discuss his book, Three Days in January: Dwight Eisenhower's Final Mission, at a National Press Club Book Rap on Thursday, Feb. 16 at 7:30 p.m., in the NPC’s Conference Rooms. 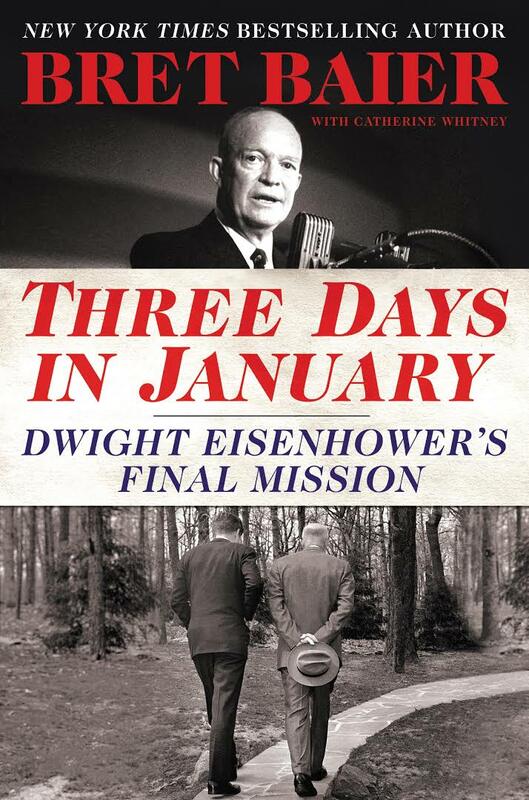 Three Days in January examines the last three days of the presidency of Dwight D. Eisenhower in January 1961. Baier casts the period between Eisenhower's now-prophetic farewell address on the evening of January 17, 1961, and Kennedy's inauguration on the afternoon of January 20 as the closing act of one of modern America's greatest leaders - during which Eisenhower urgently sought to prepare both the country and the next president for the challenges ahead. Baier is the Chief Political Anchor for Fox News Channel and the Anchor and Executive Editor of Special Report with Bret Baier. Before assuming the anchor role, Bret served as Chief White House Correspondent for Fox News Channel between 2006 and 2009. Prior to being named Chief White House Correspondent for Fox News Channel, Bret served as National Security Correspondent based at the Pentagon, reporting on military and national security affairs, as well as on defense, military policy and the intelligence community from 2001 to 2006.